Although one of the older craft breweries in the country, Anderson Valley’s switch to being more innovative with the return of Fal Allen from Asia in 2010 has helped see the company grow thanks to barrel-aged beers and its Gose lineup. 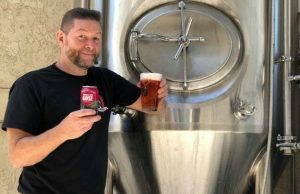 Allen, who previously had worked at the Boonville, California brewery​ from 2000 to 2005, returned after former owner Ken Allen sold it to current AVBC owner Trey ​White. 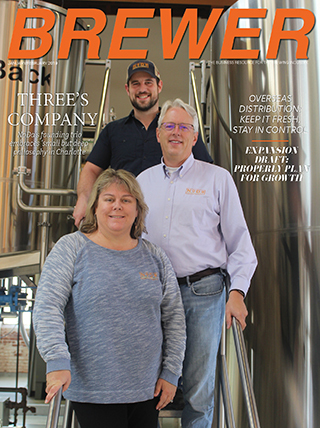 Fal credits White with the push for growth from a small brewpub to distributing beers across the US. ​White has been proven right​ as some breweries that didn’t innovate have ​moved aside. That included a line of Goses, a partnership with Wild Turkey to procure Bourbon barrels on a needed basis along with what Allen thinks is an under-appreciated line of barrel-aged Sour beers. Spurred by using what he learned from living in Asia and working toward infusing Asian dishes into beer, Allen already had some thoughts on innovation as White encouraged him and the AVBC brewing staff to explore new ideas to help spark the brewery’s reach. “We tried using different flavors and ingredients at first and those had some good success,” Allen said. “Really the big one was Gose for us. … and it kind of changed everything about Anderson Valley. It really got people to look at us in a different way and it got us back in the minds and the view of a lot of consumers. But Gose was a beer style Allen had never even heard of before the brewery started brewing it. While they were working on that process a local homebrew said that the process Allen described would be a great way to make a Gose. “Both the lab guy, Andy Hooper (now as Seismic Brewing), and I said, ‘A what?,’ “ recalled Allen. So the duo did some research and bought a couple commercial examples that they could find from Leipzig. “We thought, yeah we can do this. That does sound like a good idea,” Allen said. “We took that process and now we had a style of beer to aim for. And we tried to make a Gose as close to the Leipzig style as we could from tasting them and I think we came up with a pretty good way of doing it. ​The innovation hasn’t stopped either. 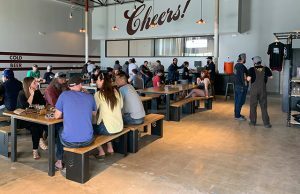 Allen said many experiments have yet to leave the brewery’s taproom, like their new Brut IPA and a few other creations he didn’t want to disclose before presstime. ​“Because it hasn’t traveled and it’s so fresh it’s going to taste best at the taproom,” he said of the Brut IPA. “If you’re a beer fanatic and traveling through an area, that’s one good reason to stop and have a beer at any taproom is to try it fresh versus trying it in the bottle or the can. Allen said everyone has probably seen some pretty crazy beers out there. He noted a squid ink Pale Ale along with coming across all kinds of crazy fruit. “I’ve been fortunate enough to give presentations and lectures in other countries,” he said. “So throughout Southeast Asia and throughout South America where they have all kinds of interesting fruits that we don’t know about or get up here in the U.S. Achieving a level of success with barrel-aged Sours takes patience and tasting Allen said. He had just finished up doing a barrel-tasting session with Joey and Billie Anderson of Brews Brothers, a craft beer bar out of Los Angeles, and Allen said they were blown away by how different the same beer can age in different barrels. ​It’s been a learning curve on tasting Sours. ​There are initially flavors that you’re unfamiliar with or don’t think you’re going to want in the beer. Brettanomyces and the flavors that it makes is a good example of that​, he said​. Some of the flavors that some of the strains of Brettanomyces makes can be very strong and have quite an impact. That’s true of a lot of things​,​ like acetic acid as opposed to lactic acid. ​Allen think​s​ a little bit of acetic acid really opens up a beer and gives it more fullness. ​“If you let it go too far it just tastes like vinegar​,” he said​. ​“​I think that’s ​one mistake that some newer brewers make​.​ They ​think IPAs have always been all about the hop punch and ​so ​they think that ​Sour beer should be made the same way. ​Luck has also played a role in the success of the barrel program, specifically being able to source new barrels when needed. 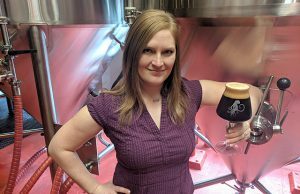 White went to college with someone who worked at Wild Turkey and they were able to broker a deal to use the company’s Bourbon Barrel’s exclusively for it’s Bourbon barrel-aged ​Oatmeal Stout. 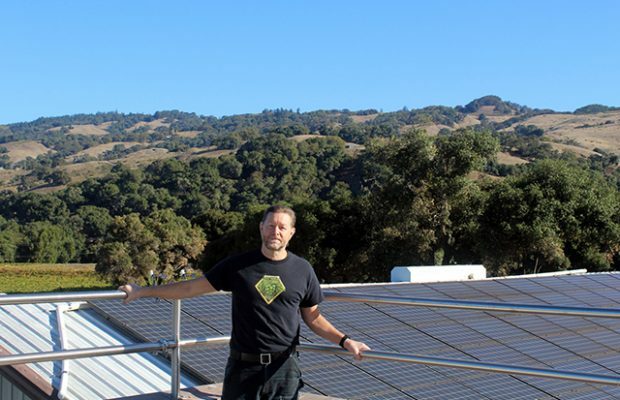 The ​brewery — located roughly a two-hour ​drive north of the Bay Area — ​is in the middle of wine country and there are 40-​plus​ wineries just in ​Anderson ​Valley​. “That’s not counting the hundreds that are around us​,” Allen said​. ​“Any time anybody has a barrel infected with Brett​ — ​which is usually what they get ​and ​that frightens them​ — ​they should call us and we’ll come get them for free. So we picked up a lot of wine barrels and the majority of our ​Sour beers are done in wine barrels. Not all of them but quite a few of them. ​That’s been a real bonus for us. ​“Temperature control I think is a big deal,” he said. “If you just have a barn and you let it rip and you’re in an area like we are, you’re going to have some issues because our coldest days are sub freezing and our warmest days are over 100 degrees Fahrenheit. Topping the barrels and keeping headspace to a minimum has been real helpful for Anderson Valley as well. 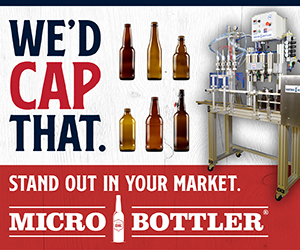 As the brewery has grown in the past decade, making sure its product is consistent across the nation is vital. Of course fresh from the source is best, but Allen said he has stumbled upon a three-year-old can of a Gose once and it held up fairly well. Finally, Allen stressed the need for a lab. He himself came from a background of lab work and wrote technical articles in the 90s for Brewing Techniques Magazine about starting up a small lab. “I’ve always been a big advocate of a brewery — no matter how small they are — having some sort of lab facility,” Allen said. “When I came here the previous owner had thought that we needed a lab which is always a good thought and he’d made a space for it and then the challenge is finding the right people and getting the right equipment. And that’s taken quite a long time, several decades. But I think it’s very important that you get a brewing lab manager. A person who knows both brewing and lab techniques and then you get a good stock of equipment to do the right kind of test that you need to do.